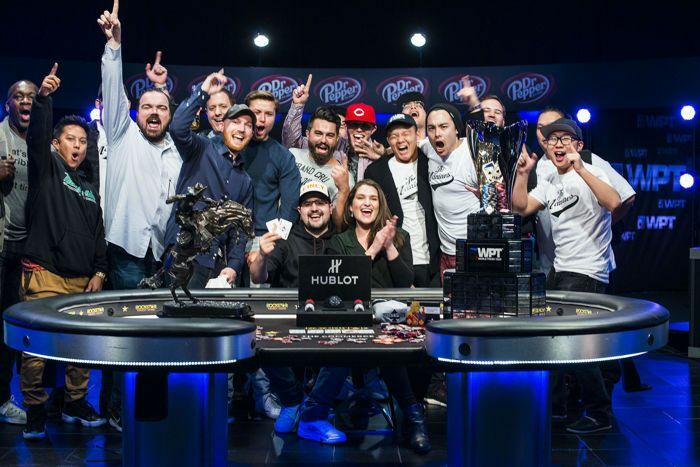 Dennis Blieden Wins WPT LAPC for $1,000,000! The 2018 World Poker Tour L.A. 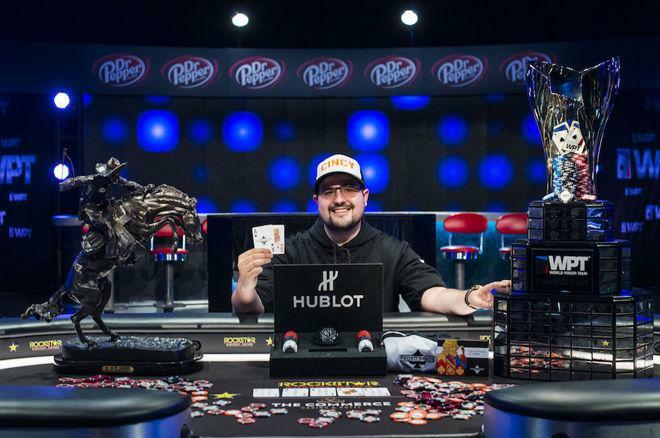 Poker Classic title belongs to Dennis Blieden, and he's $1,000,000 richer for it. It took fewer than eighty hands of poker to get down from six to a winner. Toby Lewis, fresh of his $10,000 Aussie Millions Main Event win, finished runner-up for just over $600,000. Live streamed with hole cards up on a thirty-minute delay; the final table got underway with Toby Lewis in the lead, Dennis Blieden close behind in second place. In the sixth hand of the day, short stack Manuel Martinez found queens and eventually got it in on a board of eight-eight-deuce-six with two hearts. Unfortunately for Martinez, Blieden had called from the big blind with eight-six and left Martinez with just two outs. Neither of the queens hit the river, and Martinez exited in sixth place for $186,235. Blieden showed he had nerves of steel clashing with Marc Macdonnell in a pot worth 3.3 million. That hand helped Blieden into the lead but he would give it back to Lewis not much later as the two clashed in a big hand. Lewis called down with pocket fives against Blieden's queen-nine off on a board of eight-three-deuce-ten-king to retake the position of tournament leader. Three hands later, Peter Hengsakul left the tournament area as he moved in his short stack with nine-eight suited. Blieden called with ace-seven of the same suit. The flop brought an ace, and Hengsakul was drawing dead by the time the turn hit, out in fifth place for $244,430. 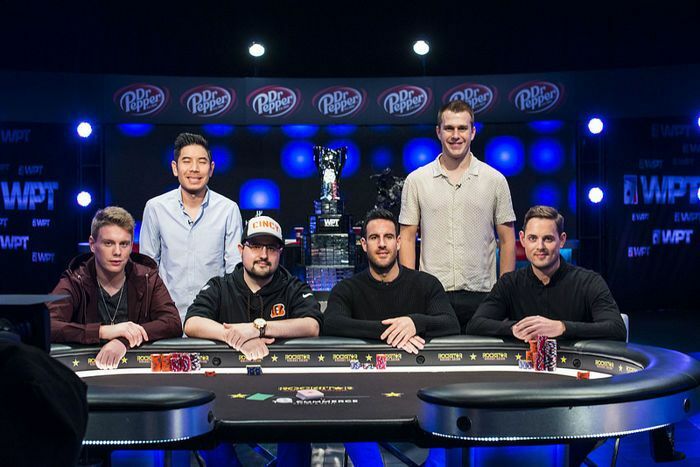 In a four million pot, Blieden retook the lead as his flush with jack-eight of spades out performed Lewis' two pair with ace-five. That made for a tight-knit top three in counts, with just Derek Wolters staying behind. Blieden showed he had nerves of steel clashing with Marc Macdonnell in a pot worth 3.3 million. Blieden bet the flop and turn with nothing but an unimproved ace-four on queen-eight-three-queen. The river ten brought in a backdoor hearts flush draw but Blieden had nothing but the ace of hearts blocker to that flush. Blieden checked and Macdonnell bet with ace-king with the king of hearts. 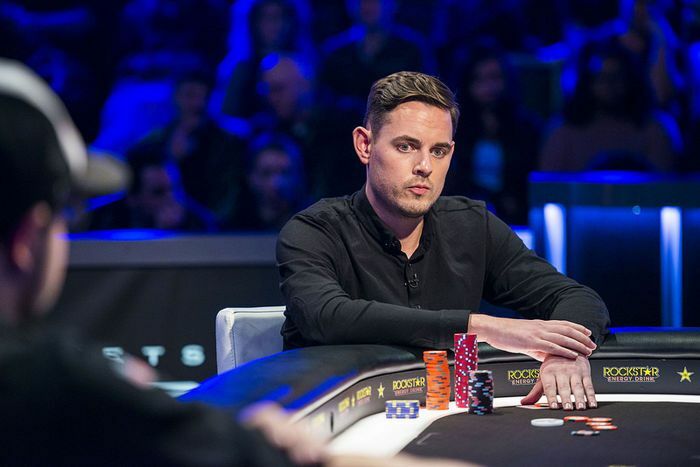 Blieden went for the check-raise all in and Macdonnell quickly folded, leaving himself short while Blieden distanced himself from the rest of the field. Wolters doubled through Lewis hitting a jack with ace-jack to Lewis' ace-queen which made Marc Macdonnell the shortest stack still in the tournament. He was ultimately the next to go, exiting in fourth for $319,310. Macdonnell moved in with ace-seven and got called by Lewis with pocket nines. A nine on the flop just about ended it for Macdonnell and he got underway packing his things on the turn as he was left drawing dead. Blieden started raising his button blind, putting out chips even before the cards were out. Another check-raise all in on the river with nothing but ace-high, this time with the best hand but no way of knowing that, saw Blieden pass the ten million mark, leaving Lewis and Wolters at around two million. Really pushing the action, Blieden started raising his button blind, putting out chips even before the cards were out. The first time, Wolters won a pot, but the second time he did take down the hand. Getting short, Derek Wolters moved in with queen-seven suited. Blieden called with king-deuce and flopped a king to just about end it. He would even backdoor into a flush to send Wolters to the rail in third place for $430,210. The heads-up started with Dennis Blieden on almost two hundred big blinds to Toby Lewis' fifty. Despite being quite deep and Lewis winning the first hand, it was all over in the next. With the blinds at 30,000 and 60,000, Lewis opened for 120,000. Blieden three-bet to 300,000 and he called the four-bet to 750,000 from Lewis that followed. Lewis had just two cards left in the deck to stay alive but wouldn't see either on the turn. Blieden check-called a bet of 400,000 on six-six-three with two spades holding ace-queen off. The queens of hearts on the turn saw Blieden check again. Lewis moved in for 2.2 million with pocket tens and Blieden called. Lewis had just two cards left in the deck to stay alive but wouldn't see either on the turn. Instead the six hit; making both a full house but Blieden was the one to take it down. Dennis Blieden had won the WPT LAPC, earning $1,000,000 including a $15,000 ticket to the season-ending WPT Tournament of Champions. Blieden had just two cashes on his Hendon Mob before, with the biggest being $21,148 for his 13th place finish in last year's $5,000 at the WSOP. He's a WPT Champion now, his name inscribed on the one-and-only WPT Champions Cup. WPT on FSN L.A. Poker Classic Part I: Is Squeaky the Most Annoying Man in Poker?